Rolls Royce approached Business Evolution with a simple brief: Help us identify the sponsorship role for major expenditure and transformation projects within the business; additionally, help us to develop and support existing and potential senior level sponsors within the business. Rolls Royce has given considerable thought, investment and effort towards the professionalism of their project management community, and into trying to determine and develop project management processes which are operationally "fit for purpose". The business delivers projects which are diverse, complex, high profile and high risk across major capital expenditure, new product introduction and business transformation projects. As a natural progression and sign of maturity in their use of project management, Rolls Royce wanted to clarify what sponsorship meant for them, to define and implement a robust and appropriate sponsorship process at senior level as part of project governance, and to support this by the training and development of existing and potential senior level sponsors. Generally, the sponsor role can have a tremendous impact on project success. However, typically the sponsor role is very unclear in many organizations: sometimes, the sponsor steps back from the project for a variety of reasons; sometimes, they are too involved and try to act as a sort of “super project manager”, which generates its own conflict and problems. Our solution was to hold facilitated workshops with senior stakeholders in order to clarify the issues and views, and then to design, develop and deliver workshops to Vice-Presidents from the UK, Europe and South America to develop and support existing and potential senior level sponsors within the business. Subsequently, a specific sponsor role definition and process was adopted as part of the standard project governance process. 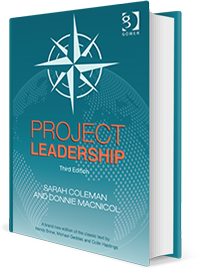 "Project Leadership" 3rd edition by Sarah Coleman and Donnie MacNicol looks at the nature of the leadership role in projects, why it is significant and how it impacts the processes throughout the project life-cycle. We emphasize a set of core capabilities around the themes of vision and strategy, relationship building, communication and engagement. The book also focuses on building personal and organizational project leadership capability including models, tools and diagnostics drawing on experiences of working with projects and organizations from multiple sectors and across the globe. The Foreword and Endorsements have been provided by industry leaders. To learn more about how we can help, contact us.